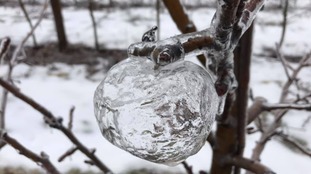 An American farmer has spotted "ghost apples", or ice perfectly shaped like the fruit, hanging from his orchards in Michigan. Andrew Sietsema, from Sparta, discovered the odd fruits after a very cold snap in the US last week, when freezing rain coated some of the apples in ice. 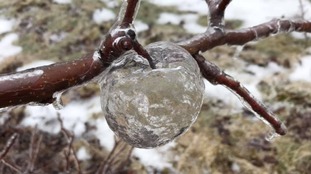 Mr Sietsema noticed some of the rotten apples would slide out of the bottom of the frozen orbs, leaving a perfectly formed "ice apple" in their place. He told NBC Chicago the apples have a lower freezing point than water, meaning that even as ice remained frozen, an apple would thaw out and leak out, leaving the icy shell hanging on the branch.